Pawan Sharma | March 27, 2011 | Grub Menu | RHCSA Objectives Be the first to comment! 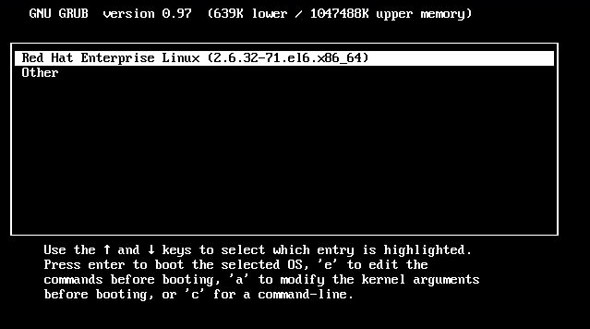 In my previous post I explain the BOOT PROCESS of RHEL 6. In this post I will explain you the GRUB boot loader and files associated with the GRand Unified Boot loader. The Standard Boot loader associated with Red Hat Enterprise Linux is GRUB, the GRand Unified Boot Loader. As suggested by the Red Hat exam requirements, for RHCSA exam, you need to know how to use Grub menu to boot in to different runlevels, and diagnose and correct boot failures arising from boot loader errors. To understand the GRUB, the best place is to start is form GRUB configuration file. Every line which starts with ‘#’ is a comment. The comment lines don’t affect the working of the GRUB file. First line suggests that this file is created by anaconda, which is the RHEL 6 installation program. · default=0 : this means that GRUB will boot RHEL 5 by default. · Timeout=5 : this means, before GRUB automatically boots the default Operating System it will wait for 5 seconds. This GRUB configuration file can be used to diagnose and recover GRUB problems.